Enjoy Charles M. Schulz's Books? Tell us Why and Win a Free Book! Welcome to Charles M. Schulz's BookGorilla Author Page! We're working hard to bring you the best deals ever on Charles M. Schulz's Kindle books. 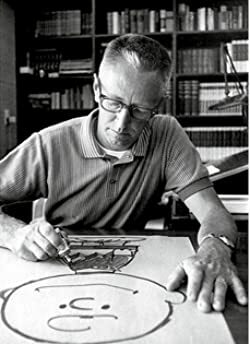 If you’re a Charles M. Schulz fan, we'd love to have your help in making this author page special. Tell us, in no more than 150 words, why you think Charles M. Schulz is great. Use this webform to send us your submission, and if we select yours we'll offer you one of Charles M. Schulz's books or a Kindle Gift Card as a free gift! Thanks! Please enter your email address and click the Follow button to follow Charles M. Schulz! This collection of 122 Sunday Peanuts newspaper strips that ran from 1958 -1961 featuring many of your favourite characters, including Charlie Brown, Snoopy, Violet, Patty, Shermy, Lucy, Schroeder, Pig-Pen, Linus and Beethoven. Linus's sincere pumpkin patch, Snoopy's fantasy world, and kite-eating trees! They're all back in this new collection of classic Peanuts strips, compiled especially for middle-grade readers. It's Halloween! Time for ghosts, ghouls, and... the Great Pumpkin? Linus is sure that this year the Great Pumpkin will finally appear. Join Snoopy, Charlie Brown, Lucy, and the rest of the Peanuts gang for some spooky tricks and hilarious treats in this thirty-fifth anniversary adaptation of the television special! Meet the Peanuts Gang! : With Fun Facts, Trivia, Comics, and More! Snoopy's Book of Colors is the perfect introduction for little ones to learn their colors along with Snoopy and his Peanuts friends. Snoopy's Book of Words is the perfect introduction for little ones to learn basic vocabulary words along with Snoopy and his Peanuts friends. Snoopy's Book of Shapes is the perfect introduction for little ones to learn about shapes along with Snoopy and his Peanuts friends. Snoopy's Book of Numbers is the perfect introduction for little ones to learn their numbers along with Snoopy and his Peanuts friends.